Speaking at the Mouat All Athletes Forum. It never fails to happen. Every single time I get brought to a school or event to keynote, motivate and inspire the crowd, it seems it’s always me who ends up coming away more motivated, educated and inspired. I’m so thankful for that. 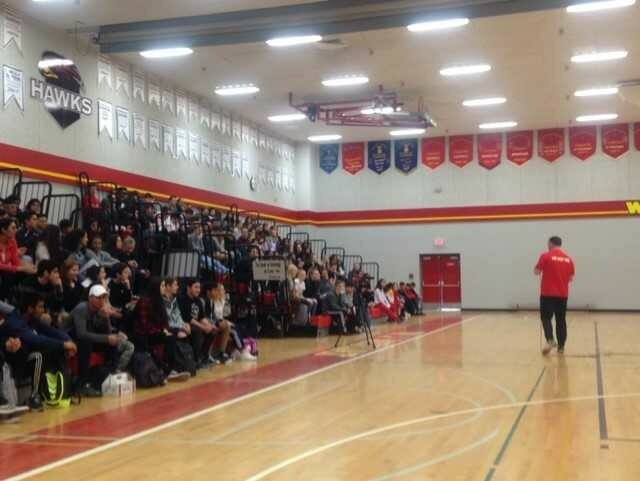 Mouat High School just had me in to keynote their All Athletes Forum. It’s a yearly assembly to reward all athletes that partake in school sports. I didn’t quite understand the reasoning of the event. It wasn’t a year-end banquet. There were no awards given out, no team speeches and no discussion even on how any teams season went. It was just me and a ton of pizza for the kids. Kind of like school movie night, and I was the entertainment. I arrived early as usual. I always want to give myself ample time to get a feel for the gym, find my bearings, sight lines and map out my movement pattern etc. I also wanted to be very clear on the premise of the event. Just to make sure my messaging matched the purpose. Or would I have to tweak it or even switch to a different talk? Coach Travis Bell. 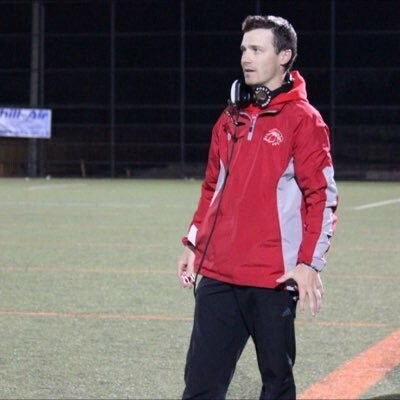 A coach that understands what amateur sports is really all about - A tool to help raise our youth. Coach Bell met me at the main office. Along with being their varsity football coach, he is also the man who reached out to me to speak and arranges this event yearly for the school. He greeted with both hands full. In his right was a school football t-shirt. The one request I have from schools that I speak at. I love high school gear. 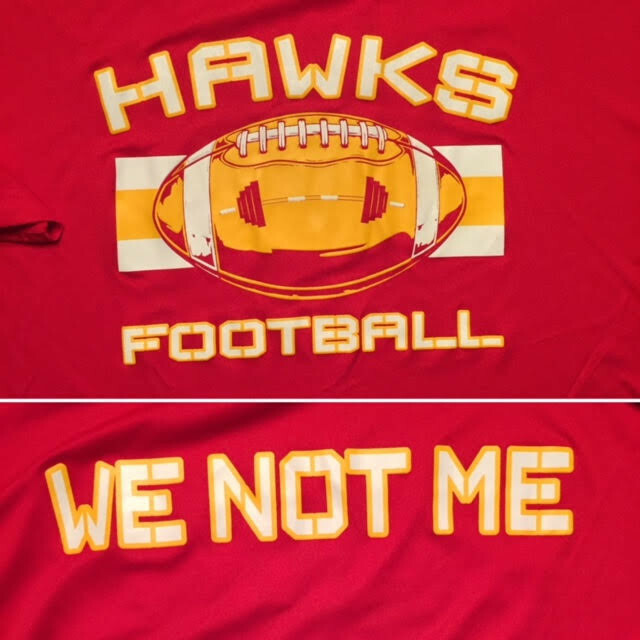 There’s just something about High School team issued clothing that brings me back to my youth. That great sense of pride I had for my school and the team I was fortunate enough to represent. I’m a sucker for both the nostalgic feeling I get and the youthful placebo energy boost I get when wearing it for workouts. I’m very good at internally creating an emotional environment. Wearing high school gear helps bring me mentally back to high school and college morning workouts. One of the things I miss most from my playing days. In the other hand was a thick stack of papers. My natural curiosity forced a glance at them. I caught the headline and enough of some of the text to form a pretty solid assumption as to what they were. You know what they say about assumptions though. I thought it better to just ask. I’m so happy I did. What I read and discussed with coach Bell over the next few minutes took the great love and respect I already had for high school sports and catapulted it to an all new level. Nice team issued gear. Love the slogan. Team first always. I will wear this in future workouts with great pride. It was their school Athletics Charter. A one-page document outlining the “athletes agreed to code of conduct,” not just on the playing surface either. This document encompassed every aspect of being an upstanding student and model citizen at the school. It addressed everything a teenager needs to know about commitment, responsibility, accountability and overall maturity. It was so impressive that I had to ask for a copy. Reviewing it, again and again, it became clear to me that this Charter was not only beneficial to teenage athletes but really, to anybody. It’s a simple guide to being the very best person you can be. To care more about doing what is right than doing whatever you feel like. To have less ego and more empathy. To have more respect and less arrogance. To give more and take less, to your school, your teammates, and any activity you commit to being involved in. There were nine promises and two concluding statements. At the bottom was a spot for a signature and date. An official declaration contract, agreeing to do all you can to live up to standards that would not just keep you out of trouble, but guide you down the path to becoming the very best version of yourself. I was so impressed to see this school prioritizing and emphasizing, building championship people over just championship teams. The contract clearly stated, that failure to meet these agreed to standards could lead to being removed from sports participation. Nobody HAD to sign them. Then again, nobody HAS to play sports either. 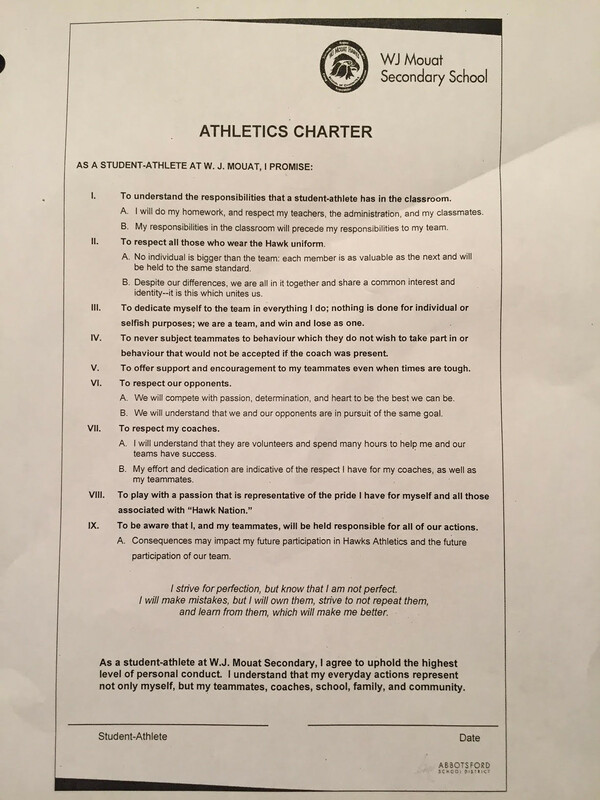 The W.J Mouat Secondary School Athletics Charter. Very impressive to say the least. Then I learned the real magic of this piece of paper. The school didn’t make it. The students themselves did! This charter was created by the student's answers to the school’s question, “What does it mean to be a Hawk”. With that data, a smaller group of student-athletes created the document I was now holding in my hand. By the people, for the people. Powerful stuff. It’s one thing to impose your school’s rules, it’s completely something else when the students themselves are setting the standard. The weight that carries is immense. This document is the student’s way of empowering the school to hold them accountable to the standards they have gone about setting for themselves. It’s a great privilege to be able to represent your school in sports. One that I took very seriously in my high school days. I was always very aware and proud of my school’s sports history and the greats that came before me. I was also very aware that what I did both on the field and in the classroom and halls would be how the next generation would grow up seeing their school and athletes, and probably act accordingly. It’s good to know that, it’s much more powerful to contractually commit to it. 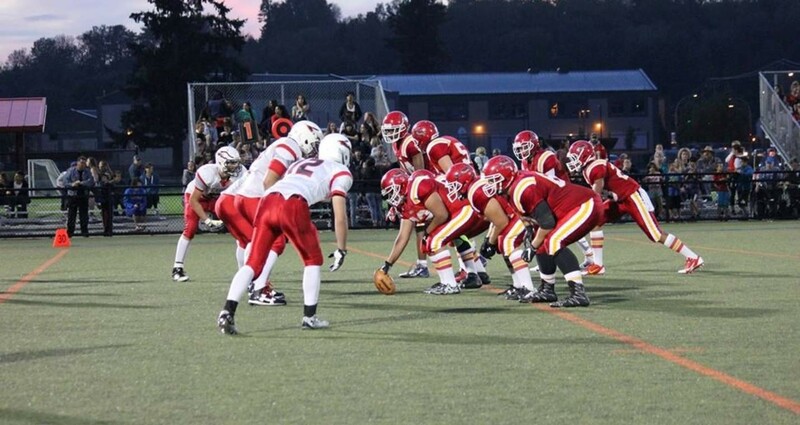 I’m proud of Mouat and their student-athletes for placing character first. For Knowing that in the end, sports are simply a vessel to help you grow and improve as a person. All the physical work ends up being more about internal growth than external technique. The real benefit of sports is all the things it teaches us that we can take with us after the game, season and career are over. It’s the person it helped turn you into that really matters, not the points you were able to score, or the all-star awards those points helped you get. High School sports need to stand for so much more than scoring touchdowns and winning games. It needs to help prepare our youth to win at life. I’m sure lots of schools now have this charter, or something very similar.  If you do and are willing to share, I would love to see yours. I’m always wanting to keep expanding my view on best practices when it comes to code of conduct behavior. I’m so proud of each and every one of those students today that signed that sheet and then went about fulfilling their promise. That in itself is a rare feat today, committing to something and actually doing it. Much rarer than an athletic kid who’s allowed to bend the rules from time to time because he or she happened to be born, fast, tall or just super athletic. We let our kids down when we don’t demand more from them. This charter was a strong reminder in the power of demanding more. Demanding that they expect more of themselves and holding them accountable to their agreed commitment to do so. I spoke for my usual hour or so. My “movie” for the kids is always part documentary, part comedy, part suspense thriller, with a touch of tear-jerker sprinkled in. I gave them all I had, as I always do. I feel it was well received due to both the great attention they gave me and the always flattering post talk conversations, photo ops and autograph signings. I felt good about what I brought to the event. I felt even better though from what I got out of it. The concept and discussion regarding this Athletics Charter really hit me. I have so much respect for schools that go this route now. Some schools may say they don’t have to do this. That they have good kids, Great. Challenge them on that. Get them to put down on paper the values they believe matter most. To formally commit to them. After years and years of public speaking and now moving more into writing, I can attest first hand that it’s one thing to be able to say something, it’s a completely different thing to put those statements to paper. Then sign them and commit to the words you have put down. Set high standards that are expected to be met. Have real consequences if they’re not. Draw a line in the sand and hold that line. It may not improve your school’s win/loss record on the court or field, but it will dramatically improve it in the only game that REALLY matters – your life.